SAN FRANCISCO, Jun. 08 /CSRwire/ – Presidio Graduate School (PGS) honored its 13th graduating class with a heartwarming commencement ceremony at the SFJAZZ Center. With frequent rounds of applause, voluminous cheering and occasional hooting, the 30 students of the Class of 2016 celebrated the culmination of years of intersectoral, interdisciplinary work and the launching (or relaunching) of fresh, forward-looking careers in sustainability leadership, policy, and business. Known for its innovative MBA and MPA degree programs in Sustainable Management, PGS has been developing visionaries, entrepreneurs, and change-makers since 2003; this year’s class is split between twenty-five MBA, three MPA and two Dual degree students, who are all following the now well-worn PGS path of breaking new sustainability ground in business and public administration with systems thinking, innovative green products and services, and cross-disciplinary partnerships and stakeholder engagement. 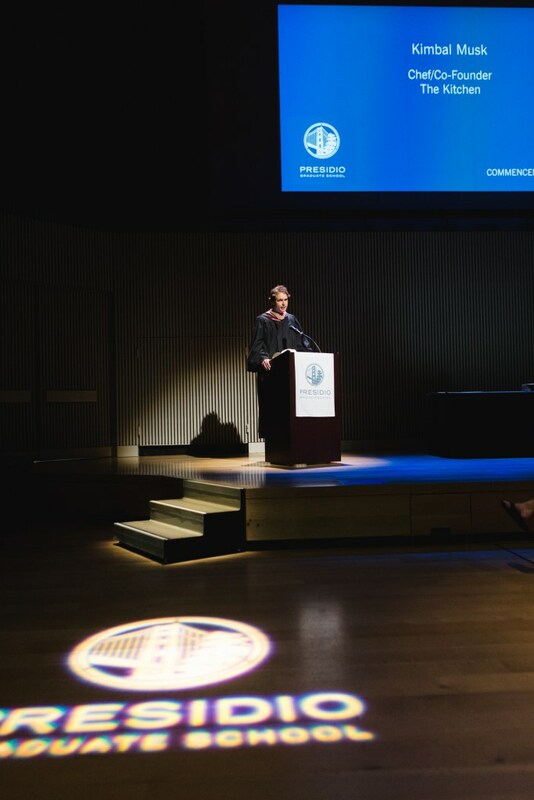 Kimbal Musk, co-founder of The Kitchen and its non profit sister organization The Kitchen Community, delivered a relaxed yet heartfelt keynote address. Citing a winter sports accident that nearly cost him his mobility as the spark that drove him to commit the rest of his life to working on, and for, only the things he felt passionate about, Musk exhorted the graduates to do the same. “I came up with three guiding principles for my life and work,” Musk said. “And those are, do only those things that make you curious, give you a deep connection, and challenge you. Join me—give yourself the permission to follow your passion.” In recognition of his untiring service to sustainability in business, PGS granted Mr. Musk an honorary degree in sustainable management. Board chair Suzanne Farver presented PGS co-founder Steven Swig with a certificate awarding him director emeritus status on the board of directors. She recognized Mr. Swig’s considerable generosity and leadership throughout his tenure with PGS, including terms as president and board chair. Together with his co-founder Richard Gray, he developed the school’s vision for an experientially based, integrated sustainability curriculum. Ms. Farver also announced that Dr. Mark Schulman has agreed to serve as president of Presidio Graduate School through June 2017, following the resignation of President and CEO William Shutkin. Mr. Shutkin leaves PGS after a productive five years of institutional growth, healthy funding, and stabilized enrollments. During his tenure, the school also achieved independent accreditation from the Western Association of Schools and Colleges. Welcome to the Sustainable Jungle!